Things like this will never look the same after reading our long interview with Sara Redstone, plant quarantine officer from Kew Gardens, London, but they're still very cool. 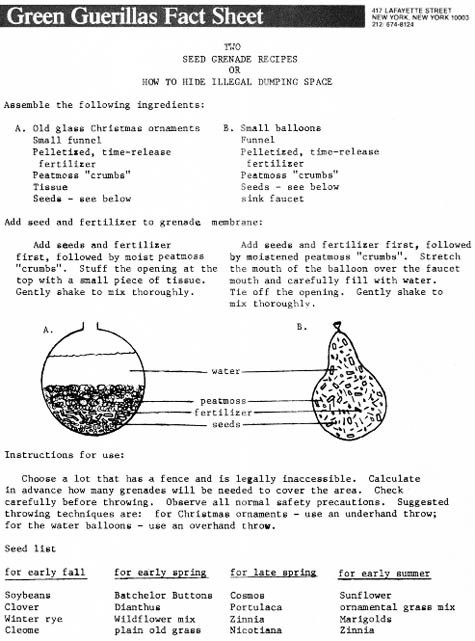 This is how to make a "seed grenade," "seed bomb," or, more prosaically, seed ball. 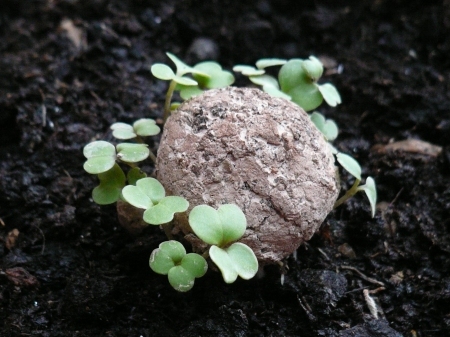 Seed balls, simply put, are a method for distributing seeds by encasing them in a mixture of clay and compost. This protects the seeds by preventing them from drying out in the sun, getting eaten by birds, or from blowing away. And they're not new. The blog post I'm quoting from is more than two years old—but "the seed ball method" itself, we read,"has been working for centuries." I’ve read that some North American First Nations’ tribes used seed balls. More recently natural farming pioneer Masanobu Fukuoka has experimented with them. And, in New York City, seed bombs were used in 1973’s revitalization of the Bowery neighbourhood and the development of the city’s first community garden. Landscapes at a distance. BLDGBLOG has already covered the idea of using military equipment in large-scale reforesting efforts, as well as the possibility of dropping "soil bombs" on Iceland. [Image: "This is what happens just a few day’s after dropping a seedbomb. The rain melted the clay and the compost, feeding the soil surrounding the bomb allowing for other plant growth." Image and text from Guerilla Gardener's Blog]. Just pack your seeds in a matrix of red clay, hurl your balls over a fence somewhere, and watch new worlds on the other side grow. a fine idea for the lazier gardeners among us. there's another way i've seen for making a similar project without the use of a plane, though admittedly needing a lot more work, courtesy of copenhagen's n55 group. I've used a similar 'recipes' in different locations. I would qualify the content a little depending on the region and the site to be 'bombed.' Use native seeds and be careful when shaping the balls as even organic fertilizers may cause some chemical burns. 'Bomb' trashed urban lots, freeway dividers, etc. I'd also like to add that using a shell isn't necessary. I'd avoid the ornament or balloon and just use a wet clay mixture--its then fully biodegradeable and furthers your argument that you're not littering if you get caught. This is something I hadn't heard of before, it's a great idea though. Like Mindygirl, I disagree with chucking water balloons and glass ornaments all over the place. Minimal think led to variation of this. 1) Buck shot for closer distances (but more spread). 2) A seed frisbee, probably in the form of compost and seeds sandwiched between two biodegradable plates. 3) Seed ball with tail. Attach a long string to a heavy seed ball, and to the string have small seed packets attached. Leaves a visible marker of where it was thrown from. I've often wondered about the social disruption effect of using this technique to seed marijuana plants. Spend a few weeks laying down bombs and then with the first rains pot starts growing on vacant lots and roadsides all over the city. Not something I'd actually do, but interesting to think about. You said "hurl your balls over a fence somewhere." Heh. I'm a high school senior applying to architecture school, and just discovered this blog. I can't believe I hadn't come across it before! My mom is a permaculture designer, so we have been making seed balls since I was little. We built a ballista, a type of medieval catapult, to throw them long distances. I've also pondered the idea of arrows with the seeds in the tip, so that when they stick in the ground, the seed (something like peas or tomatoes) have something to climb. Considering the wide variety of Christmas ornaments, I'm not sure how you conclude that they're toxic. I'm sure some are, but the post is referring to simple glass balls - glass is a cutting hazard, certainly, but it's no more toxic than sand.